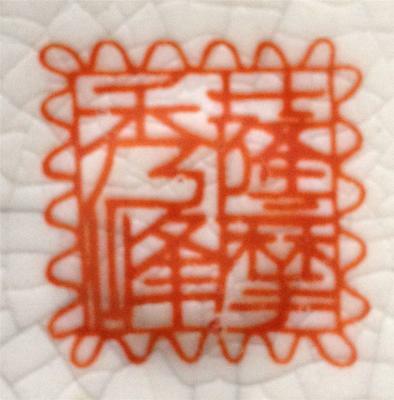 Pottery Mark Query - orange/red square stamp with looping around edges:- I went to an estate auction down the road from me. I was drawn to a piece of pottery. It is a vase that has crackling, whether it's from age or made that way (I don't know), is very beautiful. It has 2 peacocks on the front of it, flowers on the neck and a design around the bottom edge. The colors on the vase are beautiful and bright, with colbalt blue, white, greens, orange, yellow, and pinks. The top rim and all throughout the flowers, peacocks and design is gold. The lady who was bidding against me came and pointed that out to me after I had won the bid. I hope my picture shows it's beauty. I have tried looking at websites and pages to identify the mark on the bottom, but i have not seen and with the 'scalloped' or 'looped' edges that the vase displays. What I would like to know is what the mark means? I think the experts refer to this type of decoration as Chinese Famille-Rose. The mark looks like a modern version of the old red seal marks. It may well say it was made in the Qinglong period, but, they all say that, so it is likely mid to late 20th century. Chinese Famille-Rose vases do have a value to them though, and even if it's not that old, the value will still be for the 'decorative' value. The variations of value are so mixed for these only an expert could nail it. Look for the mark on Gotheborg.com and report back.